Glycerin, Vegetable Cellulose**, Purified Water. 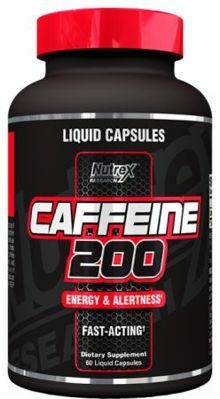 For extra energy and alertness take one liquid capsule 15 minutes before exercising or as needed. Do not take more than two servings in a 24-hour period. Contains a high amount of caffeine. Do not use if pregnant or nursing. Not to be used by caffeine sensitive persons or anyone under the age of 16. For occasional use only. Limit the use of caffeine-containing medications, foods and beverages while taking this product. Too much caffeine may cause nervousness, sleeplessness, irritability and possibly rapid heartbeat. Stop use if you experience any of these symptoms. Do not use as a substitute for sleep and proper rest. Do not exceed recommended dosage. KEEP OUT OF REACH OF CHILDREN.